SMTP Configurator for Magento : SMTP Configurator for Magento is a module by which store owner can easily setup a SMTP server on his web store so that all the emails send through his store will sent by the selected host. SMTP Configurator for Magento: SMTP Configurator for Magento is a module by which store owner can easily setup a SMTP server on his web store so that all the emails send through his store will sent by the selected host. Magento has included this module so that tracking and sending emails through the store become easy. Admin will be able to see success message for test emails. The receiver will receive the mail successfully. Admin will see a error message for test emails if mail send failed. 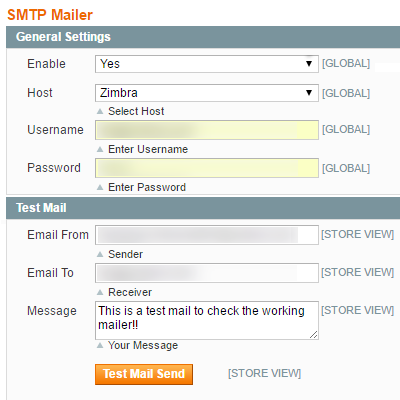 This module can be used when you want to set up a different SMTP server on your web store so that all the web store emails are sent through the selected/configured host. This feature has been included so that the tracking and sending of emails through your store can become easy. Selecting a host provider from a list of host providers. If your host name is not included, you can select others and then input the required values. Entering the Username and Password for for the selected host provider. Enter email from and to values. Enter the message for the receiver. Tap the test mail send option to send the test email. Did you buy SMTP Configurator for Magento?